This month's headlines on two-dimensional polymers showed noteworthy headway. "2-D Polymer Crystals Confirmed At Last," said Chemical & Engineering News. "Engineers Make the World's First Verified, 2-Dimensional Polymers," said Popular Science. "Propeller-shaped molecules give 2D polymers lift-off," said Chemistry World. The headlines are responding to two studies, from two different teams, that found ways to form large two-dimensional polymer single crystals and determined their structures. The two teams, in the two separate papers, announced the world's first verified 2-D polymers. 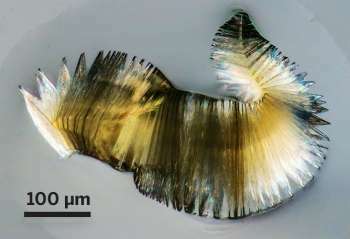 Chemistry World of the Royal Society of Chemistry, describing the work, said, "Both research teams used single crystal x-ray diffraction to unambiguously confirm the two-dimensional polymeric structure of the crystals, something that has not been achieved to date with other attempts to create such two-dimensional crystal polymers, marking a milestone in the field." Similarly, Chemical & Engineering News said what they did was a "landmark development" in research on synthetic 2-D polymer crystals. Their findings open the way to the creation of organic two-dimensional membrane polymers with more complex chemistry than graphene, added Chemistry World. Two-dimensional polymers have potential for use in nanoporous membranes and other applications. They could be put to use in areas ranging from optics and electronics to "exquisitely selective molecular sieves," said Chemistry World. One of the two papers is from the Department of Chemistry at the University of Nevada. Patrick Kissel, Daniel J. Murray, William J. Wulftange, Vincent J. Catalano and Benjamin T. King are the authors. The latter, King, designed the monomer and advised on the project. Their study is "A nanoporous two-dimensional polymer by single-crystal-to-single-crystal photopolymerization," which was published online in Nature Chemistry, on July 27. The authors wrote, "Here, we report the preparation of a fluorinated hydrocarbon two-dimensional polymer that can be exfoliated into single sheets, and its characterization by high-resolution single-crystal X-ray diffraction analysis." The other paper is "Gram-scale synthesis of two-dimensional polymer crystals and their structure analysis by X-ray diffraction," from a team from the Laboratory of Polymer Chemistry at ETH Zürich. They are Max J. Kory, Payam Payamyar, Stan W. van de Poll & A. Dieter Schlüter. The latter designed the monomer and coordinated the research. This was also published online on July 27. "Here we show that non-centrosymmetric, enantiomorphic single crystals of a simple-to-make monomer can be photochemically converted into chiral 2DP crystals and cleanly reversed back to the monomer. X-ray diffraction established unequivocal structural proof for this synthetic 2DP which has an all-carbon scaffold and can be synthesized on the gram scale ."